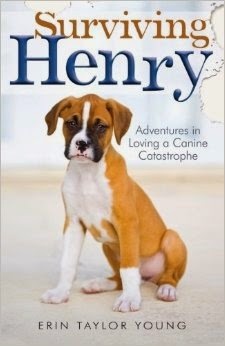 When I first saw this book, my initial reaction was "Oh, another Marley and Me." I'm not going to say that I was wrong, but I will say that even though both books were about "problem puppies", you really can't go wrong with a well written book that makes you laugh, chuckle and just shake your head. It made me very thankful that all of the dogs that we'd had over the years were "normal." I admit that I was hooked from the very first sentence of this book and had a really tough time putting it down. Thank goodness it was a quick read! I highly suggest this one to my dog loving friends. It's cute, fun and an easy read. Thanks so much for reading and reviewing Surviving Henry! I appreciate your time. I'm glad you enjoyed it!